You'll explore the less-touristy side of things at Museo del Tesoro and Climbing Tours. Your inner history buff will appreciate General Cemetery and Santa Clara Convent. There's lots more to do: admire the masterpieces at Museum of Indigenous Art ASUR, get outside with La Maja, see the interesting displays at El Centro Turistico Comunitario, and take an in-depth tour of House of Liberty Museum - Casa de la Libertad. To find reviews, other places to visit, where to stay, and more tourist information, read Sucre holiday planner. Sao Paulo, Brazil to Sucre is an approximately 8-hour combination of bus and flight. You can also do a combination of bus and flight; or drive. Traveling from Sao Paulo to Sucre, you'll gain 1 hour due to the time zone difference. Traveling from Sao Paulo in May, Sucre is a bit cooler at night with lows of 7°C. On the 6th (Mon), you'll have the morning to explore before heading off to Tarija. Tarija or San Bernardo de la Frontera de Tarixa is a city in southern Bolivia. Eschew the tourist crowds and head to Bodega Campos de Solana and Plaza Luis de Fuentes. Casa Vinicola El Potro and Iglesia de San Roque are good opportunities to explore the local culture. The adventure continues: sample the fine beverages at Bodega Casa Real, do a tasting at La Casa Vieja, stroll around Parque La Costanera, and make a trip to Plazuela Sucre. To find photos, ratings, other places to visit, and tourist information, you can read our Tarija trip itinerary planning website . You can fly from Sucre to Tarija in an hour. Other options are to drive; or take a bus. When traveling from Sucre in May, plan for somewhat warmer days and about the same nights in Tarija: temperatures range from 29°C by day to 8°C at night. Finish your sightseeing early on the 9th (Thu) to allow enough time to travel to Potosi. Santa Teresa Convent Museum - Convento Museo Santa Teresa and San Francisco of Potosi Convent and Temple will appeal to history buffs. Get some cultural insight at San Lorenzo Church and Catedral de la Ciudad de Potosi. There's much more to do: discover the riches below the earth's surface at Cerro Rico, admire all the interesting features of Stadium Victor Agustin Ugarte, make a trip to Plaza 10 de Noviembre, and examine the collection at Casa Nacional de la Moneda. For ratings, traveler tips, more things to do, and more tourist information, read our Potosi tour itinerary maker website . You can fly from Tarija to Potosi in 3 hours. Alternatively, you can do a combination of flight and bus; or drive. In May, Potosi is slightly colder than Tarija - with highs of 18°C and lows of -2°C. Finish up your sightseeing early on the 13th (Mon) so you can travel to La Paz. You'll discover tucked-away gems like Golf Tours Bolivia-Day Tours and Urban Rush Bolivia. Get a sense of the local culture at Tiwanaku and Catedral Basilica Menor de Nuestra Senora de la Paz. Spend the 17th (Fri) exploring nature at Cotapata National Park. And it doesn't end there: sample the fine beverages at Andean Culture Distillery, shop like a local with San Miguel, contemplate in the serene atmosphere at Iglesia de San Francisco, and indulge in some culinary diversions at a local gastronomic tour. To find photos, ratings, reviews, and tourist information, go to the La Paz road trip website . Fly from Potosi to La Paz in 3 hours. Alternatively, you can do a combination of bus and flight; or drive. In May in La Paz, expect temperatures between 17°C during the day and -1°C at night. Cap off your sightseeing on the 20th (Mon) early enough to go by car to Copacabana. On the 21st (Tue), head off the coast to Isla del Sol, take some stellar pictures from Cerro Calvario, and then take in the spiritual surroundings of Basilica of Our Lady of Copacabana. On the next day, don't miss a visit to Horca del Inca, then examine the collection at Museo del Poncho, then make a trip to Avenida 6 de Agosto, and finally look for gifts at The Spitting Llama Bookstore & Outfitter. Plan trip to Copacabana with our itinerary maker to find out where to go and what to do. Getting from La Paz to Copacabana by car takes about 2.5 hours. Other options: take a bus. Finish your sightseeing early on the 22nd (Wed) to allow enough time to travel to Rurrenabaque. A holiday in Rurrenabaque is a great option for those interested in exploring the region's amazing natural biodiversity, breathtaking landscapes, and native cultures of the area. On the 23rd (Thu), head outdoors with Canopy Villa Alcira and then tee off at El Chocolatal Golf Eco Resort. Get ready for a full day of sightseeing on the 24th (Fri): explore the wealth of natural beauty at Escorpion Travels. To find maps, photos, other places to visit, and other tourist information, use the Rurrenabaque online trip itinerary maker . You can do a combination of bus and flight from Copacabana to Rurrenabaque in 5.5 hours. Alternatively, you can drive; or take a bus. In May, daytime highs in Rurrenabaque are 33°C, while nighttime lows are 23°C. Cap off your sightseeing on the 24th (Fri) early enough to travel to Riberalta. Riberalta is a town in the Beni Department in northern Bolivia, situated where the Madre de Dios River joins the Beni River. On the 25th (Sat), look for all kinds of wild species at Aquicuana Reserve. To see other places to visit, reviews, ratings, and more tourist information, you can read our Riberalta holiday maker website . Do a combination of flight and taxi from Rurrenabaque to Riberalta in 7 hours. Alternatively, you can fly; or drive. In May in Riberalta, expect temperatures between 36°C during the day and 24°C at night. Wrap up your sightseeing by early afternoon on the 25th (Sat) to allow time for travel to Trinidad. Trinidad, officially La Santísima Trinidad, is a city in Bolivia, capital of the department of Beni. On the 26th (Sun), head outdoors with Outdoor Activities and then identify plant and animal life at Barba Azul Reserve. 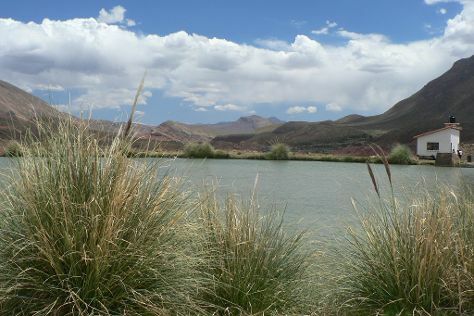 Keep things going the next day: explore the activities along Suarez Lake and then identify plant and animal life at Bolivian Parrots Conservation. To see reviews, ratings, traveler tips, and other tourist information, read Trinidad journey website . Traveling by flight from Riberalta to Trinidad takes 1.5 hours. Alternatively, you can drive; or take a bus. In May in Trinidad, expect temperatures between 34°C during the day and 23°C at night. Cap off your sightseeing on the 27th (Mon) early enough to go by car to Concepcion. Start off your visit on the 28th (Tue): admire the architecture and history at Jesuit Missions of the Chiquitos and then contemplate in the serene atmosphere at Jesuit Missions. To see photos, ratings, where to stay, and other tourist information, go to the Concepcion route planner. You can drive from Trinidad to Concepcion in 7 hours. Other options are to do a combination of flight and bus; or take a bus. In May in Concepcion, expect temperatures between 31°C during the day and 21°C at night. On the 28th (Tue), wrap the sightseeing up by early afternoon so you can drive to Samaipata. Some who come for a holiday in Samaipata fall so head over heels that they never leave. On the 29th (Wed), explore the ancient world of El Fuerte de Samaipata, then learn about winemaking at Bodegas Landsua, and then head outdoors with Centro Ecologico Cuevas. On the 30th (Thu), you'll have a packed day of sightseeing: learn about wildlife with up-close encounters at Refugio Zoologico and then trek along Che Guevara Trail. For photos, maps, where to stay, and tourist information, use the Samaipata trip app . 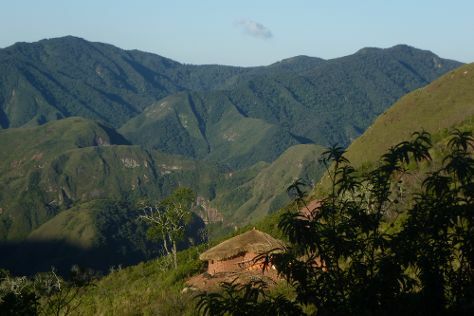 You can drive from Concepcion to Samaipata in 6 hours. Alternatively, you can do a combination of bus and car; or take a bus. Wrap up your sightseeing on the 30th (Thu) to allow time to travel back home.